Teamwork, ingenuity, and technical know-how…That’s how Duncan Aviation removes corrosion in the bores of the main landing gear forward trunnions on the bottom side of the wing. We are also the only MRO with the tooling and capabilities to perform this FAA-accepted repair procedure, and we can do it in less than a week. Nearly 10 years ago, during a scheduled quick-turn airframe inspection, significant corrosion was found in several areas of the aircraft, including the forward trunnion bores. At the time, there were only two options: Clean the corrosion using a standard hone or remove the wing and have it shipped by truck to the OEM for repair in their fixture. The hone method works by cleaning slight surface corrosion but can easily create an oval where a concentric bore is required if you’re trying to remove extensive corrosion. The second option is more precise, but the downtime is sometimes six months or more. Duncan Aviation’s Machine Shop researched an alternative repair. The team members designed, engineered, and fabricated a fixture in-house to ream the bores. There was just one critical hurdle to overcome: This fixture had to be mounted on the underside of the wing and hold the correct concentricity and axis alignment with no other points of reference but the hole itself. 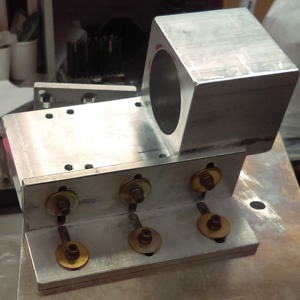 After extensive research and development, Duncan Aviation designed and developed a fixture that met all requirements and successfully removed the corrosion, staying within allowable limits. Since then, the fixture has been called into service a number of times on other aircraft, all with the same excellent results. Most recently, Lead Machinist Mark Leppky and Master Machinist Todd Hoffman took the tooling on the road. The end-customer, an air ambulance operator based in South America, needed the quickest repair possible. In preparation for the road trip, Mark and Todd inspected the kits, made extra pins, and ensured everything was packed, right down to a cotton swab. On the road, “you don’t have the luxury of walking back to the shop and getting what you need,” says Mark. They arrived on a Monday and quickly went to work. Through a series of pins, Mark and Todd slowly removed the corrosion by hand, layer by layer, .0325 of an inch at a time. The process requires continual communication and several checks and balances to maintain accuracy. After every cut, the bore’s diameter is checked and the depth measured to make sure it remains square to the back. After the final cut, the bore was within .0002 of tolerance. The final step is to use the cotton swab to alodine and acid etch the bores before installing a custom- fabricated bushing to bring the bore back to correct diameter. By Friday afternoon, Mark and Todd were packing their kits and getting ready to head home with another successful trunnion repair in the books. The innovation behind the creation of this wing fixture wasn’t because Duncan Aviation created new technology. It came about because our team members used manual data and regular tooling to conceive of and develop a new method for repair. That resourcefulness and innovation is what sets Duncan Aviation apart. New ideas and test capabilities are developed by taking a different approach to the same information to meet customer needs and change future expectations. We're not satisfied with standing still.